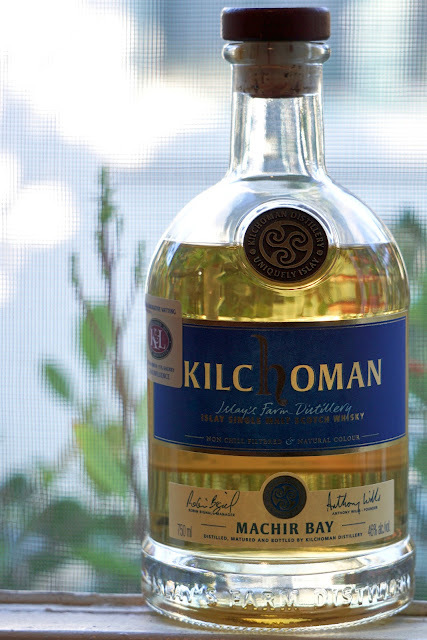 Kilchoman Machir Bay K&L Exclusive Bottling (46.0%): This is a special Machir Bay release from Kilchoman Distillery blended exclusively for K&L Wine Merchants. The batch is vatted from 85% ex-bourbon and 15% ex-sherry casks unlike the regular recipe which has the ratio as 90% to 10% instead. Color: Hay, lemon chiffon, with sizable slow legs. Nose: Iodine tincture, lemon meringue pie and dried strawberries. Clotted cream, baby bananas and diesel fuel. Sweet, fruity and creamy. A few drops of water add earthy aromas: clay, wet sand and fresh mushrooms. Palate: More salty but still sweet on the palate... Banana peppers, rock salt and coconut. Grilled pineapple rings and milk chocolate. Water amplifies some young alcohol notes. Cracked peppercorns, sage and dandelion leaves. It's tad bitter. Fireplace ash and charred meat. Finish: Salty on the lips. Gasoline and pine wood. Overall: I wish I had a bottle of the regular Machir Bay at home to compare this expression with. The whisky really tasted younger than the regular Machir Bay release in my opinion, especially after adding water but I might be wrong... Both on the nose and on the palate it is more medicinal, sweet and coastal before water but evolves instantly as an earthier, younger, greener and saltier whisky after adding a few drops of water. I kinda preferred neat because of those sweet, fruit and dairy notes but in the end it is a great whisky regardless. Ex-bourbon barrels are always a good match for Kilchoman spirit.